minor edits Jan. 1 2012. Talk of seizing the Libyan skies started early in the civil war, fed in large part by the impression that Gaddafi's insane forces were bombing peaceful protesters from the air (still no evidence). Considering real atrocities, like the 130 government soldiers executed around al-Baida for refusing to shoot protesters (we heard), bloodbath and madness loomed. The world had to act, it gradually became clear, as they had in Yugoslavia, Iraq, and elsehwere, by seizing the skies away from the repressive government and using this high ground themselves for "policing" powers. Responsibility to Protect, P2P, it's called. Respond to Panic is more accurate. Three weeks into the insurrection, it was getting desperate for the rebels. They had pushed too far and been left too long as the regime pushed back. One-by-one, cities west and then east fell back to government hands, and by March 17 loyal forces were moving in on Benghazi itself. Gaddafi had promised to go to Libya's second largest city and the de-facto rebel capitol, and crush those who refused to surrender. That coming to fruition would destroy any reasonable hope of finally toppling the colonel with this insurrection. United Nations security council resolution 1973 was voted in 10-0 at the end of a late-night session on the 17th. It called for a "cease-fire," with special emphasis on government actions. But it was never in fact to be applied to the rebels, and became a one-sided cease fire demand. The resolution also tightened sanctions, froze assets, and imposed a "no-fly zone" for government aircraft, over the whole nation. The skies were authorized to be seized as of morning light on the 18th. As the west prepared to attack and scheduled a special meeting in Paris, Libya announced a cease-fire in the evening. The world scoffed, and noted that government forces were still rushing towards Benghazi. No one bothered waiting for the rebels to agree to stop shooting, and they never did. They couldn't topple anything without firing a whole lot more. There is some confusion, but not as much as there should be, about the supposed siege of the city starting on the morning of the 19th. The new Wikipedia page for "the second battle of Benghazi" has the first shots fired, by Gaddafi's forces near the city, at about 7:45 am. The government denied any attack on Benghazi, that hey held their positions miles away. But shelling of the city's southern areas occurred, and scores were killed and injured, according to hospital staff, Even two air strikes were reported in the early morning hours by one reporter. Gaddafi troops were fought at the gates, said one rebel commander, and government tanks were roaming freely inside the city, according to many reports. The evidence of heavy weapons usage in the area, including Libyan army tanks seems entirely credible, but there are no photos of these attacking forces to show their context. Considering this abandoned army base on February 24, the rebels had heavy weapons early on and numerous tanks, among other things, after this siege. And the government claimed with a straight face they did none of that, that it was apparently the work of rebels with seized equipment shooting at each other to draw in the West. "Gaddafi has made this happen. He has lied to the international community, he has promised a ceasefire, he has broken that ceasefire, he continues to brutalise his people, and so the time for action has come." Fire in the Sky: A Government Air Attack? The last straw, merging in the news stories announcing the line in the sand, was a dramatic visual that morning from Benghazi's southern outskirts. 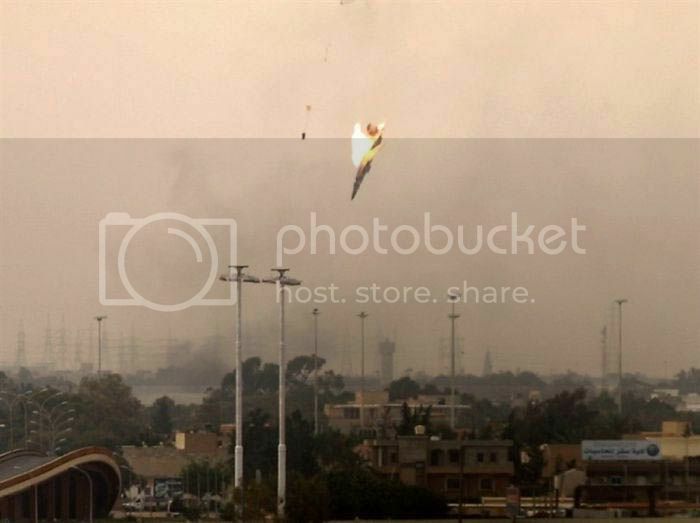 Around 9am local time the first reports and video emerged, despite the supposed total internet blockage, of a high-speed fighter jet seen streaking over the city, then bursting into flames and tumbling from its path, apparently shot from below. It came in from the sea, somewhere to the north. At first the residents of Benghazi cheered, believing it would herald the start of air strikes against Gaddafi forces still rumbling towards their city. “Is it European,” shouted one. Then it swung back around the city, describing, a high, slow circle even as artillery shells pounded the outskirts of the city. If it was a Mirage then maybe it was one of Gaddafi’s last. It's still speculated that catastrophic engine failure caused this crash, but that's an odd enough coincidence, and enough reports suggest the sound of anti-aircraft fire, that I'm presuming it was torn down with guns on the ground. Again, the government of Libya denied this was their jet on any mission for them, that they didn't intend to flaunt anything at just that moment. Again, the world didn't believe the civilian-bombing regime. Friendly Fire in the Sky? A Rebel Attack? Just before noon, the Telegraph reported "confirmed reports from Libyan rebel leaders that the jet fighter shot down today over Benghazi was one of theirs, and not a Gaddafi aircraft." The Guardian's Chris McGreal said as early as 9:45 "Some of the rebels say it’s their plane. It might have been their only plane that was shot down by Gaddafi's forces," adding at 10:19 "the rebels now concede it was their only plane." A Government Attack on the Rebel Attack? Most source leapt straight from rebels killing Gaddafi jet to Gaddafi killing rebel jet, either one meaning Gaddafi, but not the rebels, was in violation of the cease-fire-no-fly/whatever demand. 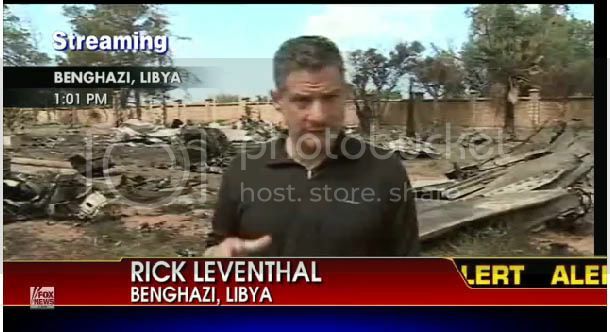 Rick Leventhal told Faux News at mid-day "we don't know" who was flying the jet. If it were Gaddafi's fighter, it'd be in major violation just for flying there. But if it was a rebel jet, it was probably just aiming for the government tanks in the city, which he said "we believe" were targeting the journalists' hotel. But if it had been a government jet, it may have been aiming itself for the hotel. Maybe the tanks were rebel-held and there to shoot down the plane. Considering again the somewhat unclear location of government forces on the 19th, it needs a bit of presumption to take the rebel version that they were at and in the city. But this is all but necessary to accept they were close enough to shoot down the mystery jet. And, of course, that would also put them close enough to be targeted by it. Within just over a day, the no-fly-zone against the government of Libya became, effectively, a no-shooting-at-rebel-air-offensives-zone. That, I believe, is unprecedented. Comments at the New Statesman suggest the craft was not a Mirage. Someone there so inclined did suggest the F-1 as compatible, the only specific model I've seen specified. Other said Mig-29, and "visual identification confirmed: it's MiG 23." Live Leak's report and Wikipedia called it a Mig-23. This is supported by further sources, but that's perhas not it either. I decided to overlay the jet photo with schematics of the Mirage F-1, Mig 23, and the Mig-27 Flogger D. I used perspective and skew effects on the photo to make it as "flat" as possible in overall proportions like these overheads (planar surfaces anyway, wings and horizontal stabilizers). Then I matched the body, nose-cone to tail-fin, as close as possible, and found all of them are reasonable fits, but the Mig-27 is the only one that seems perfect (note also the "shoulder spikes." likely off due to rotation). Then I looked at the wings. Both Migs have adjustable ones, but the sweep setting here also mimics the F-1's fixed angle. For size and shape the wings are a best fit best with the Mig-27, and is clearly out for the Mirage. The Telegraph had it. I'll spare myself (for now) the painful research of seeing just what this model means vis-a-vis Gaddafi's air force, rebel-seized Gaddafi jets, and related implications. Others better informed may perhaps have a comment to share on that. Leventhall said the pilot had directed the plane there to minimize injuries on the ground, and none at all were reported to my knowledge. The pilot did indeed eject very late, and not surprisingly, this report confirms that he died of injuries on landing. One comment makes a claim the “pilot died from wounds after ejecting, co-pilot ejected and had minor injuries. 3 days later he was back up in another plane.”  No other sources I’ve found confirm anything about a co-pilot, however. What if the government forces truly were too remote to have taken that shot? Only the rebels would then have controlled the ground fire in that area, as first noted in the presumption they had shot it down. They controlled the jet itself, as we found out, so absent AA fire from Gaddafi’s side, it was friendly fire, rebel-on-rebel. This seems most likely, in fact, going just by logic. But that contradicts rebel findings. ... Oh well. But what if this wasn’t accident? All things considered, it probably was, but my over-active imagination has me wondering if it could possibly be a false flag bit of theatrics for the foreign journalists and their cameras. Perhaps it went awry, or was re-written behind the lead actor's back. Maybe the original idea was so strafe or rocket the hotel and massacre journalists, before zipping away from the hapless civilians' defenses. The rebels would clearly not have claimed it in that case. The possibilities are endless when you have a case this full of holes and mystery. Whatever was really going on there, this mysterious incident certainly wasn't the cause of the bombing raids and 110 cruise missile strikes that started later that day. It did, however, serve a nice role tipping the scale in the public mind's eye. Gaddafi never stops flaunting, will never stop the killing and the insanity on his own, but now he will go down in flames. It started to really happen with jets that were French Mirages, to much cheering, a bare eight hour later, seeking out Saddam's forces - still stationed miles from the city. On 18 May The Base Leg Blog alerted me to a YouTube Video of a Rebel held MiG23, fleet number 804 uploaded 8 April.الطيار الليبي الشجاع دمر ارتال القذافي بطائرة قديمة - "Libyan pilot destroyed the brave old columns Gaddafi plane". There is no co-pilot. A Sim-outhouse forum discussion,with excellent close-up photo, identifies the plane as a MiG23 in rebel hands. A contemporary Reuters report of 19 March put it: Azeldin al-Sharif, an opposition activist, said rebel forces had brought the plane down by mistake over the city of Benghazi. The city came under attack from forces loyal to Muammar Gaddafi on Saturday, including air strikes by planes loyal to the government. "The fighter jet that was brought down this morning, was a revolutionary fighter jet and was hit by mistake. There is no communication on the ground," said Sharif, head of the British-Libyan Solidarity Campaign. Earlier, Reuters correspondent Angus MacSwan described seeing the warplane come down. "I saw the plane circle around, come out of the clouds, head toward an apparent target, and then it was hit and went straight down in flames and a huge billow of black smoke went up," he said. Three New River Marines were awarded a prestigious medal Monday for their part in rescuing a downed pilot near Benghazi, Libya, in March 2011. On Mar. 22, 2011, a U.S. Air Force pilot crashed his F-15E near Benghazi, Libya, and Kolle and his two crew chiefs — Staff Sgt. David Potter and Sgt. Daniel Howington, from Marine Medium Tiltrotor Squadron 266 with the 26th Marine Expeditionary Unit — responded quickly to perform a tactical recovery of aircraft and personnel (TRAP) mission to rescue the downed pilot, who was evading capture by the enemy at the time, according to the award citation. Kolle and his team immediately launched into the uncertain environment in an MV-22B Osprey from the USS Kearsage on which they were stationed with the 26th MEU. The Marines safely flew the aircraft about 150 miles at night and rescued the running Air Force pilot in under 90 minutes, according to the citation. The Pilot Mokhtar Mohammed Osman crashed his fighter jet into Baab Al Aziziyah today. He took off from military airfield in Tripoli in order to bomb Ajdabaya city, then he flew back to Al aziziyah compund intending to bomb the place of Gaddafy and his family. 2142Nato has now decided to boost flights of AWACs surveillance planes over Libya from 10 to 24 hours a day, the US Ambassador to Nato, Ivo Daalder, says.